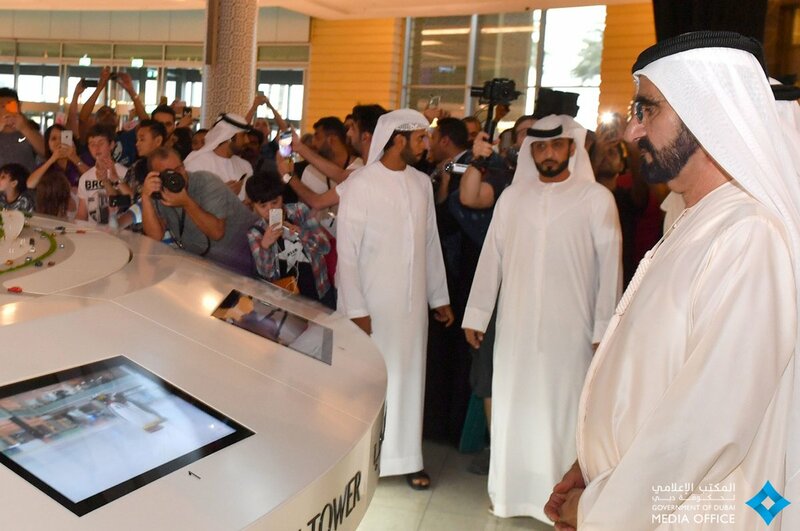 Vice President, Prime Minister of the UAE and Ruler of Dubai His Highness Sheikh Mohammed bin Rashid Al Maktoum has unveiled a compelling replica of the ‘Dubai Creek Tower’ – the icon that will frame a fascinating new skyline in the emirate. 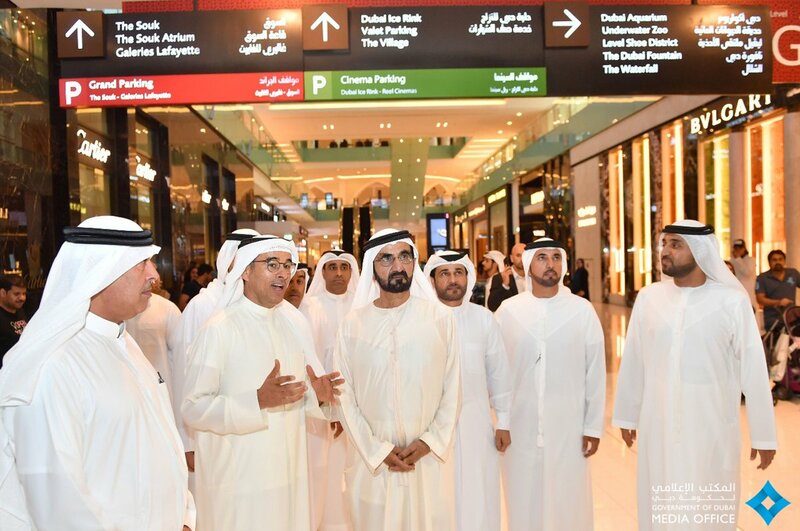 The new centerpiece of the Grand Atrium in The Dubai Mall, was revealed during a special ceremony attended by His Highness Sheikh Mohammed. 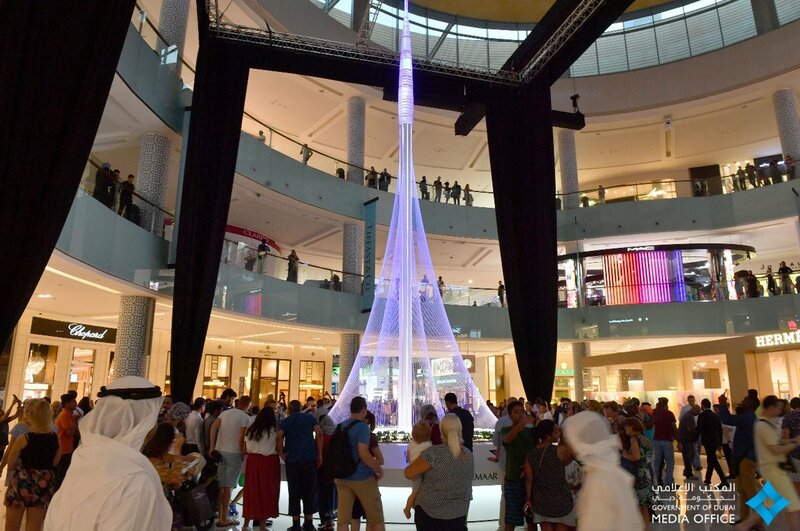 The replica is a fascinating monument that presents to the public a near-to-real experience of the design, architecture and illumination aspects of Dubai Creek Tower. Crafted by skilled engineers and professionals, the replica in aluminum and 3D-printed cladding elements weighs 3,000 kg, and took over 4,000 hours to be completed. 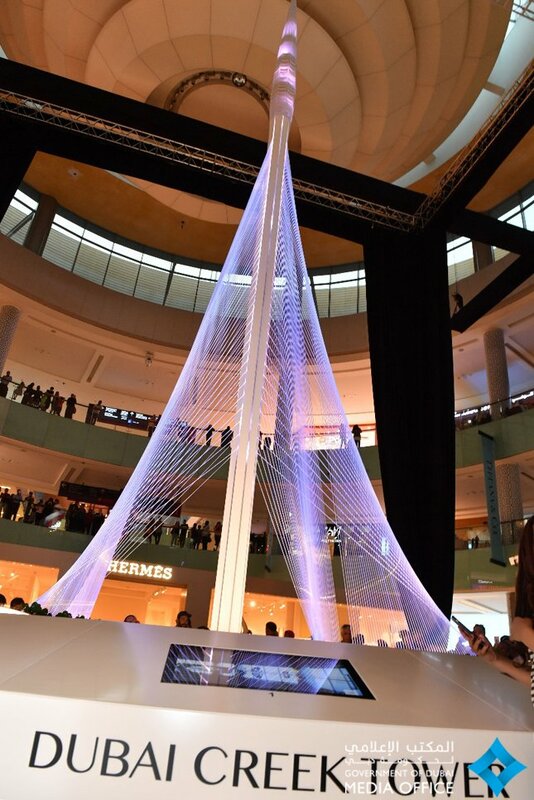 The model gives a true rendition of the architecture of Dubai Creek Tower, which takes design inspiration from the lily flower and evokes the image of a minaret. It has an elongated oval-shaped bud that will have some of the world’s highest observation decks. 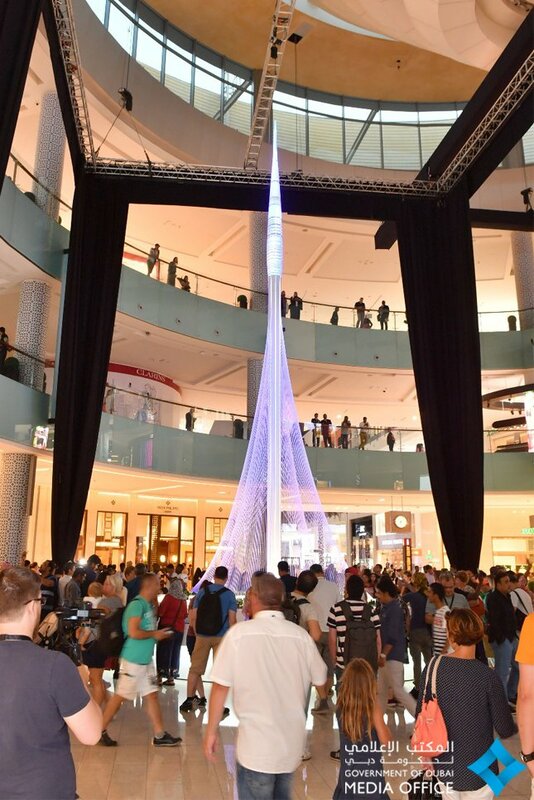 Visitors will be delighted to learn amazing facts about the Dubai Creek Tower including the world records it is set to achieve. Among the impressive world-firsts, the icon will have a record breaking 110 km of cables – the most used in any single structure – weighing over 18,000 tonnes. Horizontally aligned, the cables would stretch from Dubai to Abu Dhabi. The tower has already set a global record for its foundation, which was completed recently with over 145 barrette piles, at a length of more than 60 metres. End-to-end, the length of the piles is over 9 km. The pile cap features over 45,000 cubic metres of concrete, equivalent to a volume of 6,700 truckloads. The tower bud, equivalent to the height of an 80-storey building, is being constructed using 12,000 tonnes of steel, while the ‘stem’ will be built using 240,000 cubic metres of concrete, equivalent to 40,000 truckloads, or equivalent to the concrete needed for a sidewalk from London to Barcelona. 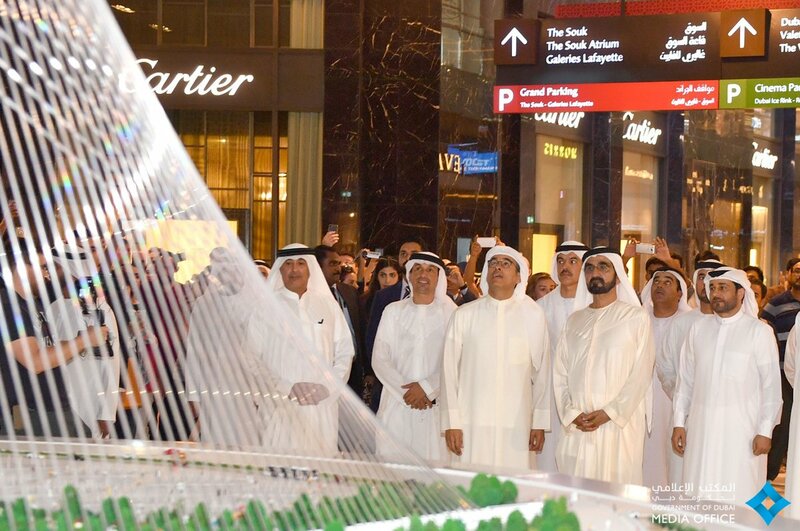 A must-visit tourism attraction, the replica adds to The Dubai Mall’s popular offerings such as The Dubai Fountain, The Waterfall, and Dubai Aquarium & Underwater Zoo. 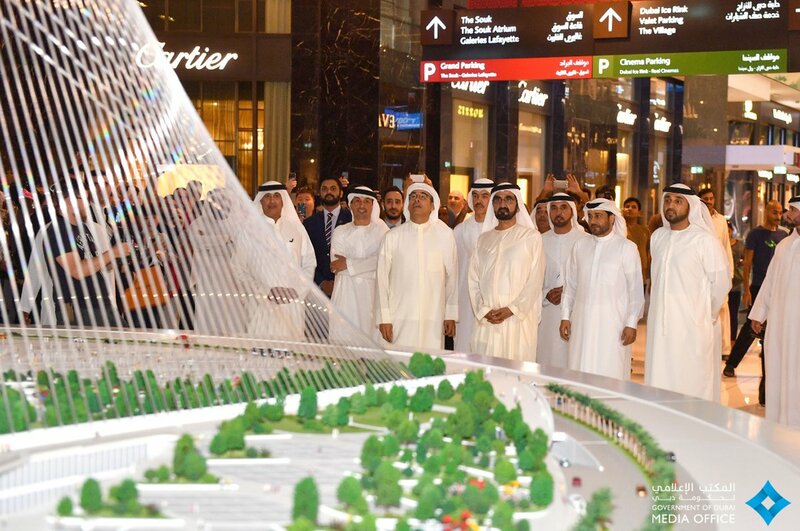 Only 10 minutes from the Dubai International Airport, the 6 square kilometre Dubai Creek Harbour, developed as a joint venture by Emaar and Dubai Holding, sits by the Dubai Creek, overlooking the Downtown Dubai skyline. It is located near the Ras Al Khor Wildlife Sanctuary, a biologically diverse wetland reserve and home to over 67 species of water birds, protected under the UNESCO Ramsar Convention. 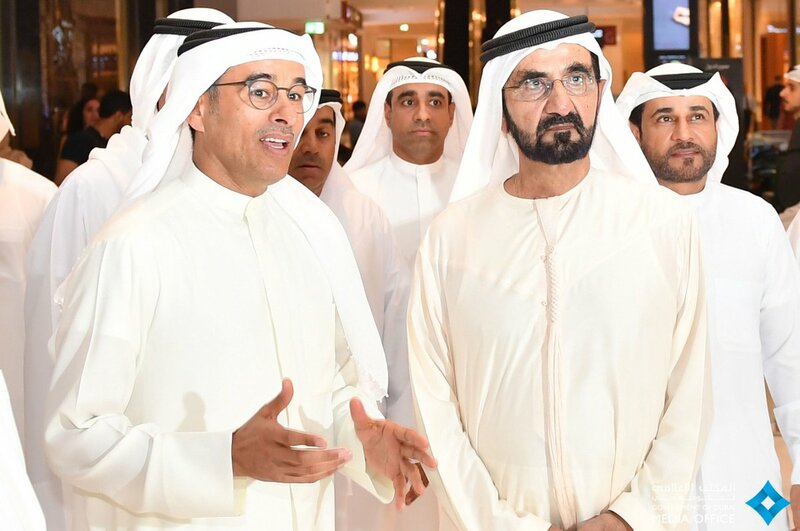 Accompanying His Highness Sheikh Mohammed during the unveiling ceremony was Emaar Properties Chairman Mohamed Al Abbar, Dubai Director of Protocol and Hospitality Khalifa Saeed Sulaiman, Chairman of Dubai Holding Abdulla Ahmed Al Habbai, and a number of officials from Emaar and Dubai Holding. Previous articleDiscover a piece of paradise in the new exclusive Valamar Isabella Island Resort close to Poreč!